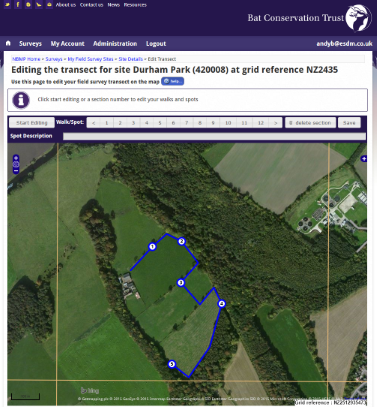 Exegesis upgraded the National Bat Monitoring Programme (NBMP) recording system from a Microsoft Access database to SQL Server with an accompanying website that allows volunteers to record their roost counts online. The NBMP comprises seven distinct surveys, which will be built over several years. The database and website have been designed in a modular way, allowing each survey to be fully implemented without dependencies on the others. So far, the roost, hibernation, field and waterway surveys have been implemented. Each survey includes recording forms, site mapping, data downloads and reports for NBMP volunteers. The mapping varies in complexity from a simple dot map for roost locations to sectioned transect editing for field and waterway surveys (pictured). In addition, there are tools to help BCT staff run the programme, including administration pages, email notifications for volunteer activity, as well as an Access administration client that connects to the database remotely. Further information from Andy Brewer.